A purpose built cartridge hat caters to the American shooter, with a caliber that is decidedly not an American round. 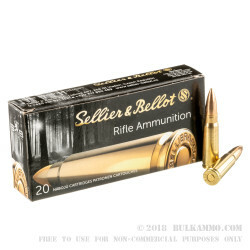 This 7.62x39 ammunition offering from S&B (Sellier & Bellot) is their take on what American shooters want (Boxer Priming, brass casings; and Copper jackets). With the 7.62x39 branching out in the more recent years instead of staying well within the comfort zone of SKS’s and AK’s, this round can make a lot of sense in bolt actions and AR uppers that have sprung up on the market. The clean build quality is indicative of S&B’s push towards the consumer shooting market in the USA. For years they have been producing surplus level ammunition and now they are making headway for producing even higher level cartridges that aren’t just for shooting in the desert. A 123 grain bullet is still in line with S&B’s philosophy of sticking to tried and true government proven loadouts, and the velocity and energy levels are exactly in the mil-surplus ranges (2420 feet per second of muzzle velocity and 1600 ft. lbs. respectively). The functionality therefore will behave exactly like the original, but with the added benefit of brass cartridge casing and boxer priming, allowing handloaders to play around with different ideas with the spent brass, and the cleaner powder comparatively to the older surplus ammo. Good quality ammo and great service. 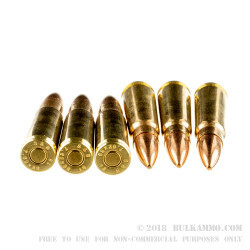 This non-magnetic ammo is great for any public or Action range! I have a custom made rifle that is primer sensitive to foreign ammo like Chia made or Russian made 7.62x39 Berdan based primer ammo. I didn't have one misfire out of the 200 rounds I used for last weekends match! Q: Are the projectiles Steel core or, are they lead core steel jacket? In certain matches, we can shoot steel jacket, but not steel core. A: Thank you for your question! Sellier & Bellot loads these rounds with a reloadable brass case and uses lead core bullets with standard copper jackets. There should be nothing that will attract a magnet in these 123 gr FMJ rounds from Sellier & Bellot. 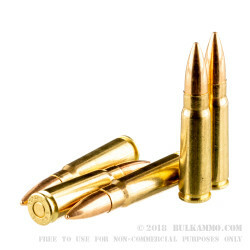 A: Hello Jim, The Silver Bear 7.62x39 ammunition does use a bimetal jacketed bullet. This bullet contains steel and will not pass a magnet test. Q: Are these boxer or bedan primers? A: Hello Mike! 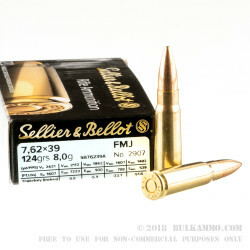 Sellier and Bellot lists their 7.62x39 ammunition as using Boxer Primed brass. Q: How fast is this ammo?